For those who don’t already know, Mountain Equipment Co-op has just opened their new store in Barrie, ON. We’ve got their press release up at our site, or you can pop over to mec.ca to find out more. I got a chance to spend some time in their Burlington store last week, and after being wowed by the green building, I spent a while drooling over their amazing bikes. For the moment, though, new parenthood provides all the rigour I can take. Head over to their website to find out more, and to find the tools to get involved. Join the movement at the 2010 National Summit on a People-Centred Economy! On May 30th, 2010, you can join the movement for economic alternatives at the 2010 National Summit on a People-Centred Economy! From co-operatives that have seen as century of change, to the latest innovative social enterprises, citizen-led efforts to build a people-centred economy are rich in their history and diversity. In the face of this recent economic turmoil and growing ecological crises, these approaches are more relevant than ever! The 2010 National Summit on a People-Centred Economy will be bringing together leaders and representatives of the community economic development, cooperative, and social economy sectors to build a common agenda and mobilize action for a secure, sustainable economy that puts people and the planet first. The summit takes place May 30th – June 1st, 2010 at Carleton University, Ottawa, Ontario. For more information on the event, click here to view the National Summit homepage, and to register, please click here! Check out the Summit’s wiki page where each of the issue papers for the six themes are available for review. This is a great opportunity for us to further advance the movement towards a sustainable economy! A few of us here at On Co-op had the chance to hear David Suzuki speak Friday morning as part of impact! The Co-operators Youth Conference for Sustainability Leadership in Guelph. A committed and passionate champion for the environment and sustainable living, Suzuki is not afraid to ask hard questions and make serious demands, even of those who invite him to speak. From a co-op perspective, Suzuki really got my attention when he challenged the value of triple bottom line accounting, that in his view, elevates the value of the economy to the same level as the biosphere. Suzuki distilled the practice into an image: the intersection of three equal sized circles representing economics, the environment and community. As a counter argument to this image, Suzuki spoke of three circles of decreasing size, one inside the other. The largest circle is the biosphere, followed by society, within which lies the human invention of economy. For Suzuki, such a model represents a way of thinking that will lead to truly sustainable living, since it underscores the fact that all life is enclosed within the biosphere. For him, the environment is not just more important than the economy, it supersedes it: without a healthy biosphere, human society can not exist to create an economy. This point is well-taken and Suzuki uses it forcefully to rail against governments and businesses when they argue that sustainability projects undercut economic imperatives. What Suzuki is arguing for, and has been for over 40 years, is that we need to change the way we think of the economy: we need to, as he suggests, stop anthropomorphizing it, treating it like a living, breathing and intimidating creature demanding an unending supply of offerings in the form of cash bailouts and eco-system destruction. The issue I have with Suzuki’s model is that it’s too steep of an adjustment, in practical terms, for most people. The triple bottom line approach currently used by socially-responsible businesses is an important step towards changing people’s minds about how we all navigate and create the world we live in. As the current recession has shown us, old habits and beliefs die hard. Socially responsible enterprises, like co-ops, and especially people who run, use and are members of them, need to be the model for a new way of living that respects the earth and all those who inhabit it. Those of us in the co-operative sector understand the value of looking at economics differently. 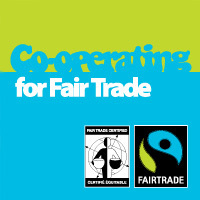 The co-op movement is fundamentally about doing business differently, and the 7 co-operative principles outline a way of doing business, and of living, that pre-dates and far outstrips the current interest in corporate social responsibility and triple bottom line accounting. For many of us, Suzuki’s argument is resonant: people do need to think differently about how they fit into the economy (or how the economy fits into them) and understand that they can have a serious impact (positive or negative) on the way we all live. Sustainability, be it in the form of renewable energy, local job retention, affordable quality daycare, safe and affordable housing, local food, or the myriad other ways co-ops are creating and sustaining strong communities, is fundamental to the co-op model. Post a comment and let us know what your co-op is doing to make economic, ecological and social change. There are numerous co-ops in Ontario that are challenging economic, social, and ecological realities by working towards a better world for all of us. Check them out by searching On Co-op’s e-directory.